Jackie Park lives in Beijing with her two kids and husband. Find her on her blog, and this original post, at bringinguptheparks.com (VPN required). We suggest finding the materials you need for these cards by setting up the English-language Baopals for shopping on Taobao. I’m planning to send out our Christmas cards by mid-next week, and I wanted to make it extra special. Now that we have kids, I wanted them to personalize their cards. Because isn’t it more touching that way? So while I was scouring the net for these little nuggets of inspiration, I came across some photos on Pinterest of children’s handprints, fingerprints and footprints used to decorate the Christmas card! For today, I’ll share about the cute footprints. 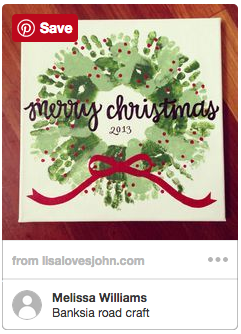 Check in again tomorrow night to see the different possible Christmas cards you can do with handprints! Let’s start with the most obvious: a Christmas Tree! Sadly the site of the original source of this project (The CSI Project) isn’t available anymore. I got this photo from a site called Bomb Shell Bling in her post about 12 Kid Crafts for Christmas. Or how about this Rudolf-inspired step by Emma Owl? Being a blogger, my favorite is ‘Twas the Night Before Christmas mouse craft by Messy Little Monster. Oh wait, here’s another cute one (although also slightly scary). It’s called “Walking in Winter Wonderland”. I got the idea from Keyona Shank’s Pinterest here. Another more complicated craft is this combination of ornaments and a mistletoe. The ornament lights are actually fingerprints while the mistletoe are footprints. I really like this angel-footprint project by Karen Kids Crafts. I’m most likely going to get my kids to try to make at least one. 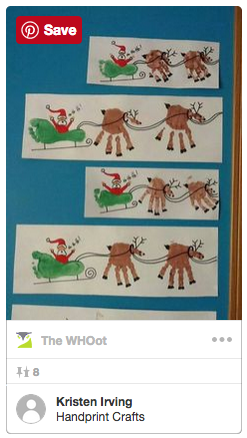 Here’s Santa and his Reindeers by Whoot! This last one I’m about to share from Crafty Morning isn’t exactly Christmas-y UNLESS you added a caption and maybe some snow? The caption could be like: Missing you this Christmas season. Merry Christmas! Or something like that. And there you have it. Twelve (plus a non-Christmas-y project) Christmas cards using footprints that kids can have fun with. Hope you find this post helpful!